Here's a card for my upcoming copics class. I haven't told any of the ladies who take my classes about my blog yet, so I figure its safe to share it! 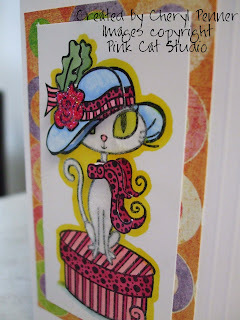 I used Pink Cat Studio stamps for this class. I used the Scor Pal for the score lines and my handy dandy crop-o-dile for punching the holes and setting the eyelets. 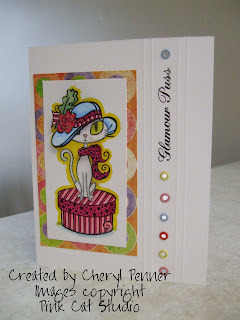 This card is done paper tole style and the second picture shows the dimension. The cat is stamped in Brilliance ink and colored with copics. I love how vibrant the copics are! She's also flocked with white fun flock, I've added diamond glaze to the eyes and stickles to the flower. I just love how she turned out! This cat is quite beautiful and glamorous too! Wow, what a beautiful card! I love your coloring and the column of eyelets looks really cool. PS. I loved your contest submission for Billy & Lily's room too. It looks like it would be so fun to play with!